The Cost of Discipleship by Dietrich Bonhoeffer, translated by R.H. Fuller and Irmgard Booth, Simon & Schuster, Touchstone edition, 1959, 316 pp. This last Epiphany, the lectionary presented the first two chapters of the Sermon on the Mount. As I approached a multi-week sermon series on those famous words of Jesus leading into the season of Lent, it seemed an appropriate time to re-read Dietrich Bonhoeffer’s classic. I have also been lately pondering the idea of discipleship, its importance in our current context and how, as a church, we direct our efforts toward growing disciples. Bonhoeffer then presents the distinct marker of true discipleship: obedience. “Only he who believes is obedient, and only he who is obedient believes… For faith is only real when there is obedience, never without it, and faith only becomes faith in the act of obedience.” (63-64) The next several chapters go on to describe the requirements of single-minded obedience to Christ–not to ideas or principles or communities, but to Christ alone. The foundation of discipleship for Bonhoeffer is simple obedience to Christ in all things. The remaining chapters of commentary on the Sermon on the Mount, and the subsequent section on issues of church doctrine (baptism, communion, saints, community) are all teasing out what it means to be absolutely obedient to Christ. I was struck by the power of this idea of obedience in Bonhoeffer’s own context. The Cost of Discipleship was originally published in Germany in 1937, as Hitler and the Nazi regime were consolidating their power over the German people by demanding absolute obedience to the Fuhrer. Obedience to orders was a ubiquitous concept at the time–and Bonhoeffer simply substituted another figure whom we ought to obey. Replacing obedience to “law and order” or the Fuhrer with obedience to Christ and the law of sacrificial love turns everything upside down. I also ponder how this works in our 21st century American culture, when obedience is loathed as a word and a concept. Especially in my progressive United Church of Christ context, obedience is connected with behavior that is uncritical, unfaithful, immature, and an affront not only to the individual but to God. We like to imagine that we have a more collegial relationship, even with the Almighty. We do not just follow orders (especially since we disagree about what those orders might be), but we see ourselves as evolving on a spiritual journey. We speak of becoming mindful servants, not mindlessly obedient–not even if our mind is replaced by the mind of Christ. It’s tough to imagine an invitation to absolute obedience to Christ generating a lot of interested new disciples. And yet, I did not disagree with Bonhoeffer’s perspective about obedience (although I did take issue with some other things later in the book). What hope have we for nurturing new disciples if obedience remains a dirty word? How can we speak of the same thing in new ways? The ideas of fidelity, loyalty, dedication, belonging and identity might address the same concept in a way more appealing to 21st century American ears and hearts, yet I think something would be lost in translation. When it comes down to it, discipleship requires saying “yes” to Christ’s command to follow, which means a resounding “no” to much of the ways of the world. There are, of course, many other things that can be said of this spiritual classic, but I will leave those to another future re-reading. 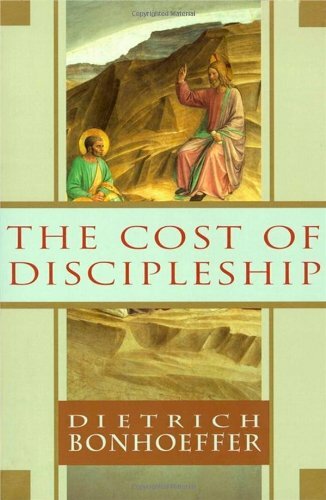 If you’ve never read Bonhoeffer, or never read The Cost of Discipleship, I commend it to you highly. The first five chapters represent some of the most powerful insights on discipleship in all of Christian theology. 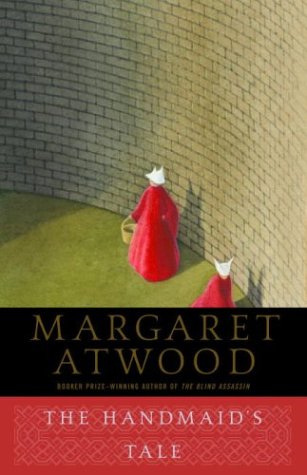 The Handmaid’s Tale by Margaret Atwood, Anchor Books, 311 pp., e-book. If you know me, you’ll be surprised that I’ve never read The Handmaid’s Tale before now. With my background and affinity for feminist literature, it was a glaring omission. Now, it has been remedied. The Handmaid’s Tale is the story of a dystopian future in the United States, where we have poisoned the world so much that fertility drops. American civilization responds by acting to control women’s bodies in a totalitarian regime. Gilead is a colony behind walls, closely guarded with Eyes everywhere so that no one can escape. The central character of the book is Offred, a handmaid. The handmaids are women who have given birth before the regime, who therefore have the possibility of conceiving again. They are forced into a bizarre sexual slavery modeled after the story of Sarah and Hagar, where Sarah has Abraham try to conceive with Hagar and give birth “at Sarah’s knees” so that the baby is considered Sarah’s. Offred’s story takes place early in the regime, because she can remember a time before, with a husband and a child of her own, which have since been taken from her. Atwood’s novel unwinds the extreme possibilities for controlling women’s fertility and erasing their individual identity. Handmaids are not the only women so controlled–the Wives (unable to conceive, but married to powerful Commanders), the Marthas (household servants), the Unwomen and all the rest are also circumscribed by the system, as are the men in the story. Religious doctrine combined with paramilitary control and panoptic surveillance bring about this situation, which binds everyone, even the most elite like Offred’s Commander. I used to think of my body as an instrument, of pleasure, or a means of transportation, or an implement for the accomplishment of my will . . . Now the flesh arranges itself differently. I’m a cloud, congealed around a central object, the shape of a pear, which is hard and more real than I am and glows red within its translucent wrapping. I found this the hardest part of reading The Handmaid’s Tale. I wanted Offred to use her narrative as resistance, to tell her own story plainly, but the system refused it. The story that emerges is fragmented and hollow. While Offred does find ways to resist and grasp for selfhood in the story, those too are fragmented and uncertain. That’s the power of Atwood’s prose–she binds her characters and binds herself in this world. It is that artistry that takes The Handmaid’s Tale beyond simple feminist polemic. As a feminist, it’s worth reading either way–but this novel and its craft not only awaken the reader to the issues of control over women’s bodies, they create a unique voice in literature. I am also left wondering about its place within the burgeoning genre of dystopian fiction, especially Young Adult fiction like The Hunger Games, Divergent, Ender’s Game and more. There is a great power in imagining the logical end of all our politics and policies. I usually reserve sermons for my church blog, but I actually had a manuscript, and several friends asked to see it, so here it is. What I actually delivered was slightly different, to be sure. This Easter sermon, both in its writing and its delivery, felt very personal and pastoral–the coming together of my love for folks as their pastor, and what testimony I wanted to share with them. It’s not fancy or creative or clever, just honest. I’m always struck by the vast differences between our Easter celebrations today and that first Easter in the garden. Neva and Becky and I—along with the choir and the liturgist and the bells and everyone else leading today’s service—we’ve been planning and organizing and working for weeks toward this morning’s service, so that we know where everything goes in the Order of Worship, what words to say, what songs to sing, with the music in the right order and the props in the right places. But that first Easter was confusing and disorganized from beginning to end. Mary and Peter and the other disciple went running to the tomb and back, frantic, panic. Where have they laid him? We don’t know where they put him. Sir, if you know where he is please tell me so I can go and get him. Where is he? No one knew what was going on. It was a mess. And look at all of you here in your Easter finery. 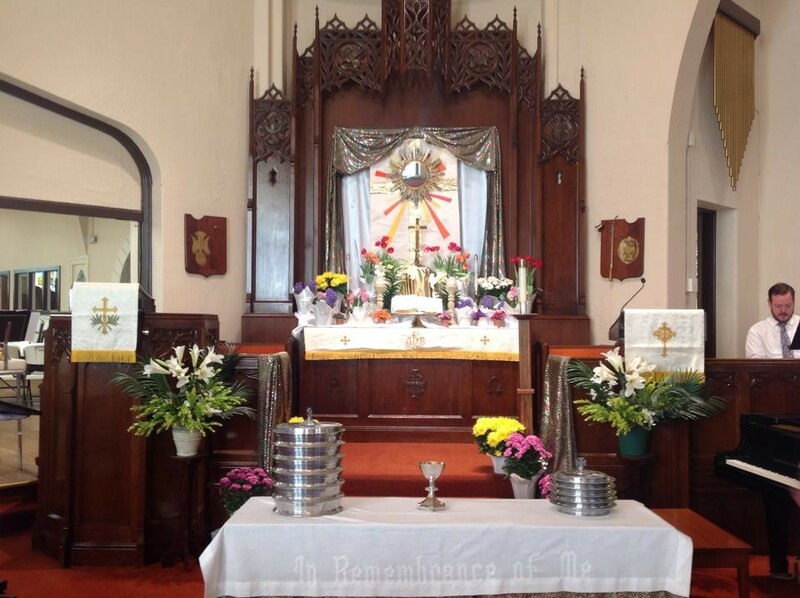 We’ve got ourselves and our children looking their best, our sanctuary decked out in all its splendor. But that first Easter had everyone dressed in mourning clothes, bleak, tear-stained faces, carrying the spices to tend to the body, buried in fear and bereft of hope. Today, we sing “Shine, Jesus, Shine,” with the radiant Christ before us. That first Easter, though, there was none of that—there was Mary, silently standing before the empty tomb, weeping into her hands. Jesus did not appear radiant or majestic or powerful—he was so humble, so earthly, she mistook him for the gardener. On the surface, all those contrasts seem so dramatic—our Easter experience and the experience of Mary and the disciples seem so out of sync and disconnected. And yet. And yet I’d wager that more than a few of us came to church this morning—even with our Easter finery on the outside—more than a few of us are still wrestling with Mary’s question, with Peter’s despair, with the unnamed disciple’s doubt. We may look pretty today, we may have our family together, starched and ironed—but the grief and the pain of day to day living are not far from the surface, are they? Death, illness, loss, financial woes, addiction, family tensions—all this and so much more may have been put aside for Easter Sunday, but they will find us again soon enough—come tomorrow, or maybe even this afternoon. We are hopeful that showing up to this church service will lead us to joy and beauty this day, that it will make Jesus alive for us somehow—because much of the time we cast about from day to day wondering, like Mary, where he is. Can you tell me where they have taken him? Please, someone tell us how to get back in touch with Jesus again, because he is lost and we are lost without him. We go along with the Alleluias and the shining glory this morning, because we want it to be true, we want it to be real—but many of us are still wondering if the empty tomb is just, well, empty—if this whole thing isn’t just plain empty, if it all just amounts to nothing. My friends, as your pastor, as one who cares for you and loves you, as one who wants nothing more than to provide a splendid Easter service that sends you all out proclaiming “I have seen the Lord,” the reality is that there is only one thing that I can do before you this day. It is the only thing that Mary could do, the only thing that has kept this Christianity thing going, year after year, Easter after Easter, resurrection after resurrection for two thousand years. I can testify. I can tell you that I too find myself asking “where is Jesus?” Where have they put him? Why have they taken him away? I may stand up before you looking starched and ironed and put together, but I bear the same burdens of doubt and despair that you do. 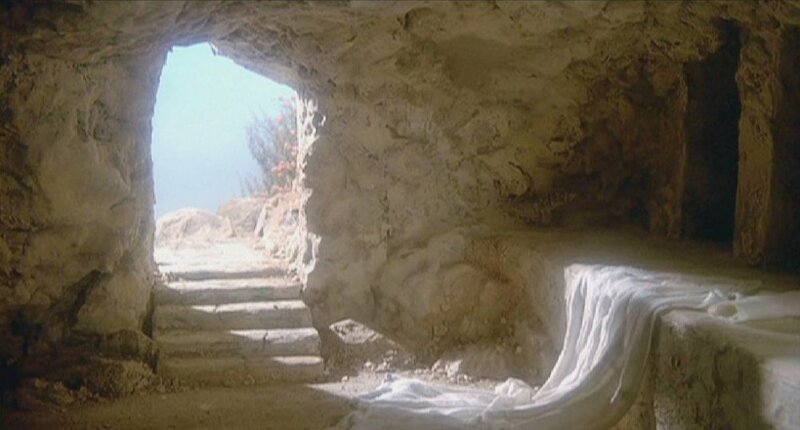 I too wonder sometimes if the empty tomb is just plain empty, and there’s nothing there, nothing here at all. But when I sit here in this empty sanctuary, late at night or early in the morning, praying at nothing, wringing my hands with despair, every now and then I hear it—quietly, silently, coming from the back of my mind yet somehow beyond me—I hear the Savior whisper my name. And then I remember—I have seen the Lord. I have seen the Lord. I stand before you today and proclaim to you that I have seen the Lord, that I believe in the resurrection. I don’t believe in the resurrection because of something that happened 2,000 years ago—I believe in the resurrection because I have seen Jesus today, and he is alive among us. I have seen lives I thought were over—people whose addiction was so severe that I thought they were lost forever. But Jesus appears to them, calls their name, and they find a way to let go of their addiction and live again. I have seen Jesus, and he is alive. I have seen relationships so estranged, marriages so pain-filled, parents and children so filled with anger and hurt that I thought they were dead—but somehow Jesus shows up, calls out names, and people find a way back to love again, back to life again. I have seen Jesus, and he is alive. I have seen people who have been victims of violence and hate and abuse, people who have every reason to be bitter at God and bitter at the world, hear Jesus call their name and stand strong to proclaim instead that “love wins,” because nothing else but love will set them free to heal. My friends, I have seen Jesus, and he is alive. I have seen tornado survivors, in this congregation and beyond, whose lives have been torn to shreds and scattered across the fields in destruction. Survivors like Louella Akers, who lost all four of her limbs due to a tornado-borne bacteria, then lost her home to foreclosure while she was hospitalized for more than year. She believed her life was over, that she would spend the rest of her days lying in bed, helpless—but Jesus called her name and told her there was more to do. New technology has given her four new robotic limbs, and March2Recovery and New Hope Services gave her a new apartment equipped with everything she needs to adapt and live independently. She started out walking everywhere, but now she can even drive again. My friends, I have seen Jesus, and he is alive. I have seen my former congregation, the Old South Church in Boston, just feet from the finish line of the Boston marathon and last year’s terrible bomb blast, transform an occasion of terror and catastrophe into a witness of hope and new life. They requested people knit scarves in the blue and yellow marathon colors, to be delivered to runners at their annual Blessing of the Athletes service held this morning, the day before the race. Hoping for a few hundred, they received more than 7,000—and they have been out on the street every day since Tuesday passing them out to athletes, to first responders, to survivors, with prayer and tears and so much love, transforming a scene of blood and death into a place of triumph and love. I have seen Jesus, and he is alive. I have seen St. Luke’s, once left for dead after conflict and betrayal, hear Jesus call our name, challenging us and reminding us that God still has need of us in this place, serving this community—and watched a miracle unfold here, as we let God remake us in a new way—new people, new worship, new ministry, new building—so that now we are alive and we have been resurrected. My friends, I have seen Jesus, and he is alive. None of these resurrections are simple, or instant, or magical, or easy, or pain-free—coming back from the dead is not for the faint of heart. It demands faith, and trust, and hope, and often a great deal of hard work. But resurrection is possible. The question of “where is God?,” the doubt-filled emptiness of the tomb, the despair of death—those things are real, as real as the cross on which Jesus died. But resurrection is real too. I have seen the Lord, not 2,000 years ago, but right here in our midst, and he is indeed alive, and he is whispering your name, and he is inviting you to be resurrected with him. Because Jesus is alive, you can be too. Whatever it is that is afflicting you and killing you, Jesus can call your name and set you free. Whatever it is that is burying you and entombing you, Jesus can roll away the stone. Whatever keeps you in the darkness of death, Jesus is the light of resurrection. I have seen the Lord, and he is alive. And that means we can be too. Alleluia. Alleluia. Alleluia.